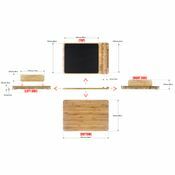 MOUSE PAD / MAT AND DESK ORGANIZER: A Low friction and smooth large surface area bamboo mouse pad and desk organizer tray. 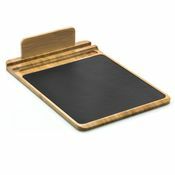 HOLDS PENS AND SMARTPHONES OR TABLETS: An all-natural bamboo tray and mouse pad that includes a slot for pens and pencils as well as a holder for your smartphone, tablet or other electronic device so tools stay within close reach. 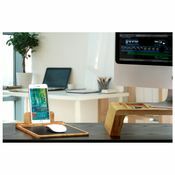 MADE OF ECO-FRIENDLY BAMBOO: Constructed of 100% natural premium bamboo classified as a super renewable resource, this mousepad is durable, lightweight, moisture resistant, and easy to clean. WORKS WITH ALL TYPES of MICE: Mouse pad is optimized to glide effortlessly with traditional corded mice, cordless optical mice, and new laser-based mice. Also features non-slip rubber feet that offer stability and protection from scratching the table or desk surface. 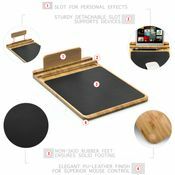 NO ASSEMBLY REQUIRED: The best mouse pad for work, home offices, dorms, or gaming, assembles with no tools required and ready to go out of the box. It’s time to maximize your desk space and clear up the clutter with Prosumer’s Choice Bamboo multifunctional Mouse Pad/Mat and Desk Organizer. In addition to a large surface area mouse pad made of optimized composite rubber, this unique mousepad securely rests inside an all-natural bamboo tray that includes a slot for pens and pencils as well as a holder for your Smartphone or Tablet. 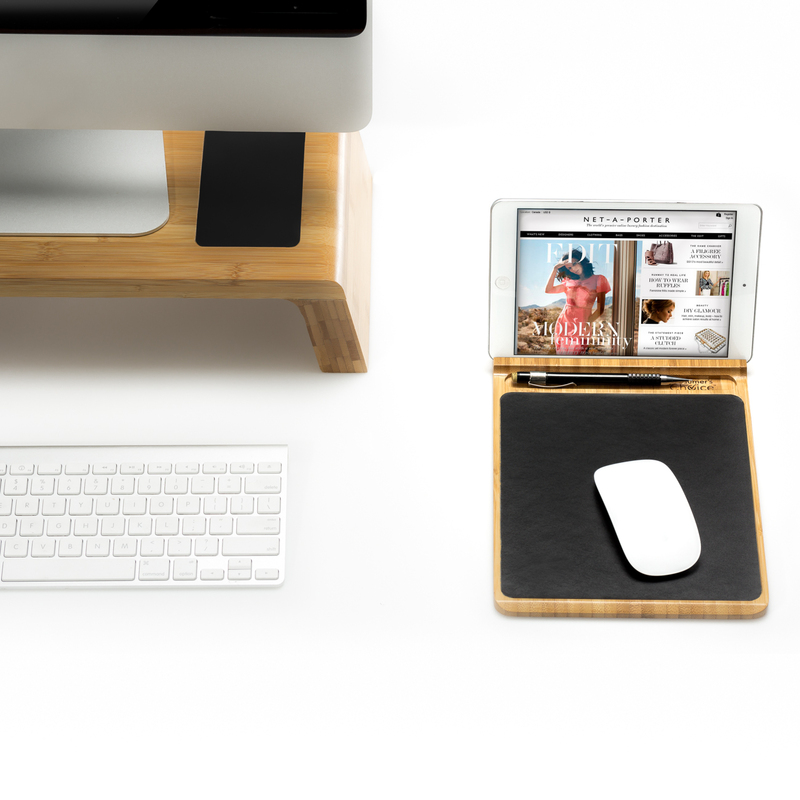 With your essentials in one convenient place, you won’t waste time hunting down pens or pencils and your electronic devices will always be within reach. The tray is made of sustainable bamboo with a smooth and natural finish. Bamboo is not only eco-friendly; it’s lightweight, durable, and less prone to cracking or warping than pressed wood desk organizers. The natural finish will dress up any desk, and this mousepad and desk organizer can be used by left or right-handers. The large surface mouse pad is made of black coated rubber material so those inevitable coffee spills won’t show up as stains and the rubberized non-stick bottom keeps the mousepad firmly in place. Your mouse will easily glide over the mouse pad with the large, smooth surface area that is optimized for standard corded mice, cordless optical mice, and new laser-based mice. 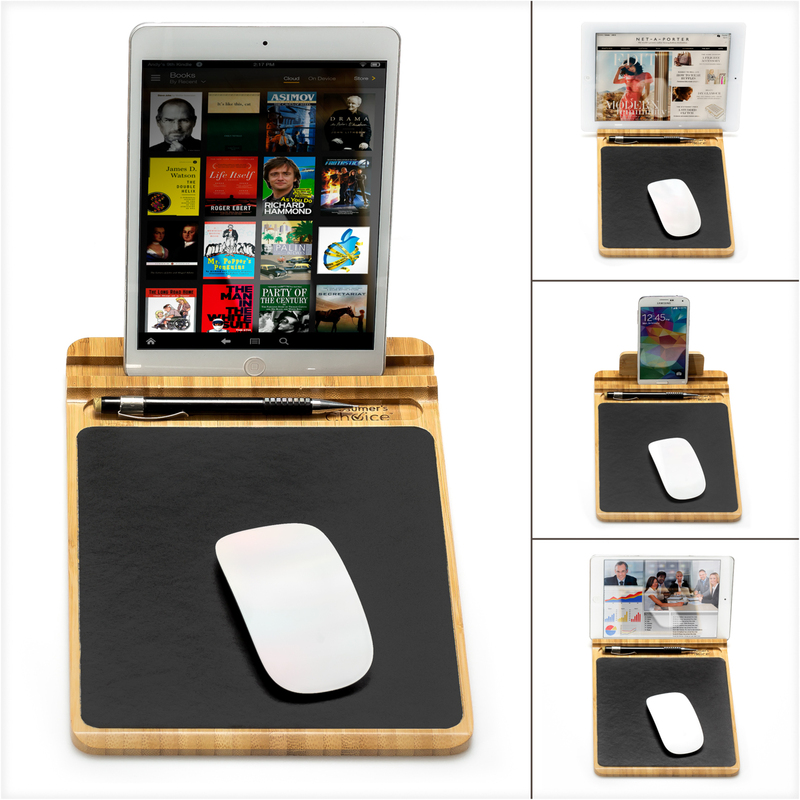 A great mousepad for work, dorms, home offices, or gaming, the Prosumer’s Choice Bamboo Mouse Pad and Desk Organizer is easily assembled with no tools required so you’re ready to go out of the box.